The cool winds come across Lake Erie and the days start to get shorter. Flocks of bird stop along the lake to feed and rest as they continue to head to their southern destination. The air in the morning has a hint of crispness and the grass is wet from the dew. The maples and ashes start to turn orange and red. That all should be happening as it's early October, but it isn't. The winds instead are hot and sweltering. The birds are wondering if they should return to Canada. The morning air is thick with humidity and the trees haven't dropped a leaf. Where's autumn as people are asking that? But steelhead have been sneaking into the rivers since mid September. I caught fish at the lower end of the Rocky on September 13th, probably the earliest in recent memory. The river was off color from a recent rain and the water temperature was creeping into the upper 60s. The fights were fast and done quickly. There wasn't any hot dogging or quick pictures. They were released quickly and there was a tinge of guilt that I shouldn't be fishing for them because they were at the threshold of dying from a prolonged battle. It was a good evening as I caught seven bright silver bullets. However the weather for the upcoming weekend was going to be hotter. The heat never left for the remainder of the month. The water temps went over the 70 degree mark and I hoped that those fish retreated back into the cooler depths of the lake. I would return to the sidelines and wait it out. There was no rush to get back on the water. Autumn is a special time for me. After a long hiatus, I welcome the change. But I start to grow impatient. The heat refuses to leave, but others are enjoying the late summer and many want it to continue as long as possible. I long for the cool nights and the changing of the leaves. My fondest memories are hiking along the rivers and seeing the vibrant colors of the trees against the shale cliffs. 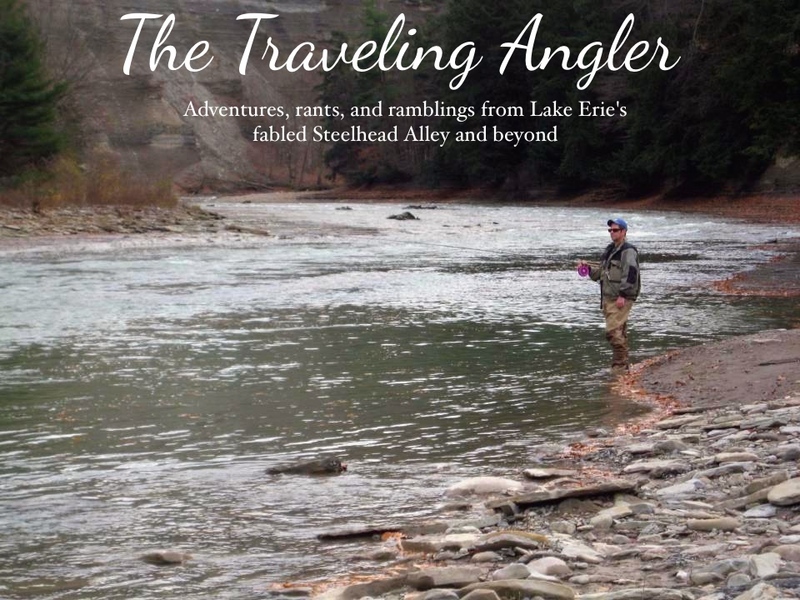 In the lake, steelhead start to head towards the mouths of the rivers and creeks. They also patiently wait for the right conditions. Some are more eager than others and move into the lower reaches of the streams. When the water rises they start their journey. This morning I cross over the interbelt bridge going into Cleveland and lighting flashes across the city landscape. The wipers move the specks of rain and I'm listening to my music. I head east and the darkness is interupted by more lighting. The air is ripe with humidity as I'm running the air conditioner. Summer stubbornly refuses to yield. The rain starts to intensify and I hear the odd rumble of thunder. I quietly sip my coffee and I'm memorized by the lighting. I finally reach my destination, Conneaut Creek. There's a couple cars park along the road. I get out and I hear the rumbles of thunder over the lake. The air is thick and I see mist coming off the creek. I dress and start to walk down to the creek. All of the tress are still green and I hear the chorus of tree frogs in the surrounding woods. I enter the water and touch it, it feels warm. The water is off color and I wonder how many fish have moved up. 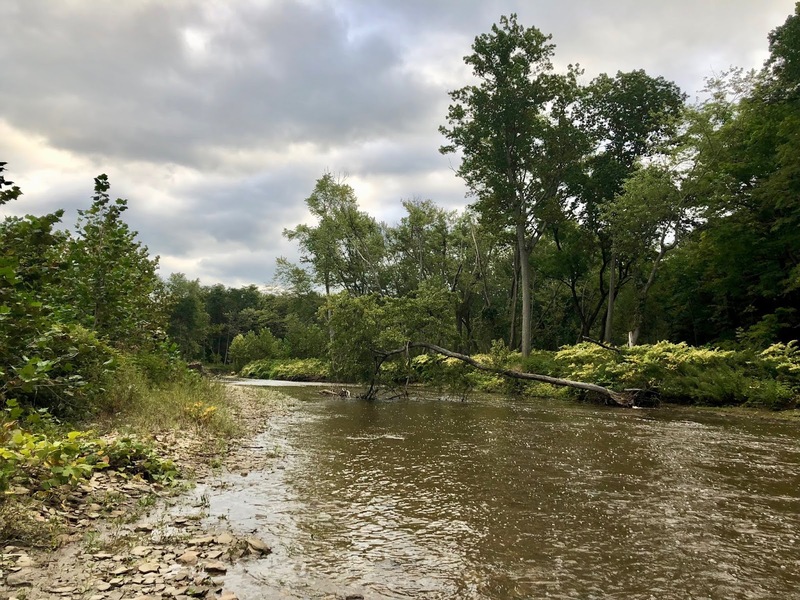 Conneaut Creek is unique because it starts in Pennsylvania and flows into Ohio. Both states stock it and the creek is very popular with early season steelheaders as Pennsylvania stocks a fall run strain of steelhead. The morning turns into a grind as I slowly get into fish. Not a lot, but enough that I start to explore further up. With the threat of rain, I have to wear to my jacket and I start to become uncomfortable because I'm sweating and starting to get hot. As with every fall, the streams have changed in appearance. The large willow now hangs over the tail end of the pool. Fishing it becomes impossible. The other pool upstream has straighten out and there's a large tree in the middle. Rocks, sand, and gravel are moved about creating different flows and bottoms. It's a constant relearning of the rivers as I bemoan the lost of another favorite spot, only to find another. I fish the riffles, runs, and pools. I get further up and the number of fish caught drops dramatically. It becomes evident that there's not a lot of fish. The sun starts to come out and I decide to head another stream farther west. I crank the air conditioner and crack open a bottle of water that I guzzle the contents entirely. I arrive at the Grand and the lot is empty. I down to a dozen sacs so I this will be the only spot I'll fish. I change from a long sleeved shirt to tee shirt. The walk to the river is short and it's surprisingly low and clear which is usual for the Grand. The wind is hot as I stand on the rocks and cast out. With the warm water temperature, the fish will be in the faster oxygen rich waters. Just like with Conneaut, the Grand also doesn't have a lot of fish. I catch 3 steelhead out of the same small run. I have 3 sacs left and I unceremoniously dump them into the water. Look across the river, everything so green that feels more like July than early October. I disassembled the rod and head back to the car. I pull out on the road and I see people walking in shorts or riding their bikes. Autumn seems so far away. Eventually it will come. The days are getting shorter and shorter. The heat will give way to the cooler weather from Canada. The leaves will eventually turn and gradually the entire Alley with be a rich collage of reds, oranges, and yellows. Until then, I'll patiently wait for that time.